I can’t believe that I haven’t posted this recipe before. With picnic season in full swing here, I suddenly realized that I’ve been keeping this unbelievable salad recipe all to myself! This dish is probably one of the most-cooked meals in my household, and in my opinion, the only lentil salad recipe you will ever need. I love it so much in fact, it’s being served at my wedding in August. Enough said. This dish was first served to me by my fabulous friend Mia who is a phenomenal cook in her own right, and I love going to her house to eat because she has such a beautiful understanding of how to make healthy food taste amazing. She also purchases very high quality ingredients, and is not afraid to experiment in the kitchen – two qualities I admire very much. This lentil salad recipe is no exception. The flavours of this dish are totally outstanding, yet unexpected. The ingredient list may seem a little long, but after closer inspection you’ll notice that it is mostly just spices, ten of them to be exact. It is this special combination of flavours that creates a truly remarkable salad that is lip-smackingly tasty and totally addictive. I should also mention that this salad is the perfect picnic food, as it transports well and is a superb make-ahead meal – ten times tastier the day after! It keeps in the fridge very well for 2-3 days. The star of the show is the delectable “Du Puy” lentil, sometimes referred to as “the poor man’s caviar”. Du Puy lentils are quite a bit smaller than green or brown lentils, and are revered for their ability to retain their shape after being cooked. Green, brown, and red lentils are great in soups because they are soft, mushy, and tend to fall apart, but those would be less-than-perfect choices for a sophisticated salad. Du Puy lentils work better in salads than in soups and stews because they tend to be a little more robust, and when cooked properly, they will retain just a little tooth. You can find these lovely legumes at any quality grocery store, natural food, or health food store, just make sure they say Du Puy – otherwise they are a French lentil knockoff. Sacré bleu! Lentils are one of the yummiest sources of folate (also know as folic acid) – just one cup of cooked lentils provides you with almost 90% of your daily recommended intake! And why is folate so important? You’ve probably heard about this vital vitamin in regards to pregnancy, as it is critical in the prevention of birth defects. Folate also functions to support red blood cell production and help prevent anemia, allows nerves to function properly, helps prevent osteoporosis-related bone fractures, and helps prevent dementias including Alzheimer’s disease. Folate received its name from the Latin word folium, meaning “foliage”, so it’s not wonder that other excellent sources of folate are dark leafy greens (yum, your favorite!) – kale, romaine lettuce, spinach, asparagus, turnip greens, beet greens, mustard greens, parsley, and collards to name a few. This may explain why North American diets seem to be on the deficient end of things when it comes to this B-vitamin, as folic acid is available from fresh, unprocessed food. The good news is it is easily absorbed, used, and stored by the body. Folic acid is also manufactured by intestinal bacteria (remember those probiotics? ), so if colon flora is healthy, we have another good source of folic acid. Make this salad!!! You won’t regret it. It’s so incredible. Everything about it. And it makes lots. I can’t wait to see what it’s like tomorrow – from the comments it seems like it gets better and better each day it spends in the fridge. I served it with rice, hot falafels , pickled mustard greens, roasted sweet potatoes and tahini dressing. THANK YOU for this divine addition to my repertoire. How many servings does this lentil salad recipe make? Just finished a big bowl of this salad and it is AWESOME!!!! I was short on a few things so used 1/2 cup dried cranberries and 1/2 cup dried cherries, had no nutmeg, cardamom or clove but dressing was still awesome! Added finely diced celery and chopped walnuts and fresh cilantro and basil. Thanks for the suggestion of the fresh herbs as I find it adds sooo much! Next time will try adding some roasted beets and crumbled goat cheese as another commenter suggested. Thanks for this recipe it will be made regularly in my house. I like lentil salad as well, but my favorite is a viaigrette dressing with lentils topping tender spinach leaves, in turn topped by cubes of fresh mozzarella cheese and chopped roasted almonds. Strips of oil-packed sun-dried tomatoes are a nice addition if you have any on hand. That said, the name of this particular lentil variety is not “du” Puy; it’s Le Puy, after the location in France where it is grown: specifically, the volcanic area around Le Puy-en-Velay in the Haute Loire département. It”s a beautiful area with an interesting history. Sorry for the typos. An iPad keyboard and my stubby fingers are a poor match. And I’m back – sorry for the repeated comments. I’ve learned that both Le Puy and du Puy can be used – it depends on the context. It seems most common (I live in France a bit north of Le Puy) to see the lentils referred to as Le Puy; however, if one is being more formal and wishes to specify where the lentils came from rather than just the name of their origin, one would say les lentilles du Puy (the lentils of Le Puy). Either way works and I mistook my personal experience as if it were the correct way. Love this lentil salad, very interesting dressing! Tried it for the first time about a month ago and am making it again today for my lunches this week (I serve over arugula and top with goat cheese). Thanks for the recipe, sooooo good. I noticed that you do not instruct to soak the lentils in this recipe. Is this typical for lentils? As I thought I should be soaking all of my legumes/beans/whatever a lentil is. Hi. You don’t need to soak dried lentils. Just bring up to the boil, keep it rolling for ten mins or so, then simmer till chewy. You don’t need to soak lentils, but if you soak them over night, drain and rinse them before you cook them, they’ll be easier to digest. Although soaking is not necessary, it certainly makes lentils– and legumes in general– more digestible. I almost stopped eating legumes a few years ago when I finally accepted that thy were the culprits which were causing my gas. But I’ve since learned from my naturopath how to prevent this problem: I soak the legumes for 24 hours, dump the water, soak them again for up to 24 hours. (It hastens the process if the water is warm, but not hot, so I’ll leave the lentils in a pot on the stove and turn it on for 5-10 minutes when I’m working in the kitchen. Then, I’ll cook the lentils, but half-way through, I’ll drain the water again. Needless to say, this is a long process, so I’ll always cook a large pot, and freeze the res for use in other recipes. I FINALLY made this and so glad I did. I did use french lentils because that’s what I keep stocked, but since they keep their shape I figured it would be fine. And it was. Much better than fine. Certainly deserving of the title ‘best’!!! How did you ever come up with this fantastic spice combo?? Hi Sarah. I am thinking about making this salad for a large party. How many people do you think it serves? I’m trying to decide how many batches to make. Pingback: Berbere Lentil Bowls with Garlic-Ginger Collard Greens | Loveleaf Co.
Made this a day ago..was DELICIOUS! Complete hit with whole family and will definetly be made again and again. 100% hit in my house! I always make it when we have a company who are wary of vegan food. Thanks for this recipe! My husband calls it ‘falling in love lentil salad’ as he says every time I make it he falls in love with me again. <3. What can beat that? It’s one of my favourites too. And every time I go to a potluck (even with total strangers) there’s almost always a bowl of it on the table. Love! This recipe is the bomb. Trying to sound like my 13 year old 🙂 It’s so delicious and so easy to make, win-win. The 13 year old does not belly ache when I make this. He loves it. Thank you for the best ever lentil salad. This recipe is amazing! Savory, and a little bit sweet and spicy. Lentils are a great plant based source of folate and iron. I was glad to find something that I can make a batch of and bring to work all week. Plus, my friend that hates lentils loved this salad (I think it was the firmness of the Du Puys). Thank you! This might double post, sorry (internet not behaving). LOVE this–just thinking about it and I want to make it. If however you do not have all the spices on hand, you can make something similar with 1 tbsp mustard, 3 tbsp balsamic vinegar, 2 tbsp curry powder, and a little more than a half cup of oil. But make this one, it is totally worth it! A fun way to eat is in lettuce cups or on endive leaves. Enjoy! Such a delicious dish, and what a crowd pleaser! I used LePuy for the Lentils, and Sun Dried Tomatoes for the dried fruit (3oz 1/2 dried, & @n3oz in EVOO). An hour before serving, I let it come to room temperature, then tossed with a lot Arugula (my sister Lexi’s suggestion). It was delicious and was a huge success at the potluck I attended last night. This ‘Best Ever Lentil Salad’ and a simple ‘green tossed salad with walnuts & feta’ were the only two side dishes completely consumed; by 12 adults! Thank you for sending the recipe to me, dear little sister!! I am eating this lentil salad while posting the comment. I layered this with arugula and feta cheese for a solar eclipse picnic. Huge hit! Since the first time I tried this recipe, I have made it at least once every couple of weeks. All those spices together create a surprise explosion of yum my mouth. It’s good for you crack, basically. I made a version of this salad (no capers) and took it on a road trip with my daughters. I can only say it is better the third day than the second and is better the fourth day than the third! Great recipe, and our go-to for make ahead food. I agree, this was delicious. We grow lentils so always looking for new ways to use them. Took it to a potluck today and many asked for the recipe. I had just purchased a sprouted lentil trio from Costco that takes only 8 minutes to cook! Worked great with this recipe. I made it as is with the ingredients listed. The additions I added were the walnuts, a bit of arugula, carrots and cukes chopped fine. I was only missing the capers and cardamom. Was pleasantly surprised how all the flavors mixed together so well. Couldn’t you substitute quinoa for lentils?? Pingback: 24 Blogs for Healthy Vegan Recipes - A resource for practical, everyday plant-based recipes! as everyone comments, this salad IS the best ever! My family loves it, crowds love it, vegans, carnivores, you name it. It’s just that good. We love it with roasted beets, which I keep in a separate container. Roast beets until tender (do NOT ever boil beets! ), skins and dice. Add finely grated fresh ginger and pressed garlic. Season with good salt, pepper, balsamic vinegar and a splash of EVOO. Just tremendous! Thank you my fellow Canadian eh! I wanted to see what all the fuss was about with this recipe so I made it. Only had brown lentils in cupboard, left out capers and currants and added dried cranberries, fresh coriander and pepitas. OMG , its delicious. (left out the salt, didnt need it anyway)…. This is the most incredibly delicious lentil salad which I now make repeatedly. Am vegan and is in my recipe book forever. Truth = The Best Lentil Salad EVER!! I double the capers (because I love them) and added some chopped celery and walnuts to mine. The dressing is incredible and I will probably use it for some other dishes as well. Next time I will make sure to have arugula to add to the salad. Thanks, this one is a game changer! I am 36, cooking for 20 years, yet have never made a lentil dish that stands up to being rotation worthy. I am very exited to try this!!! Thank you! I had a salad similar to this at a catered event and it was amazing!! I was so excited to find this recipe and I can’t wait to get the ingredients to make it at home. This recipe rocks! My husband never really cared for lentil salad until he tried this version..only difference I did was scale down salt to 1/2 tsp since I cook my lentils in broth and a bay leaf. Like the suggestions, I also add diced celery, carrots, green bell peppers, and crumbled goat cheese. Thanks a million! AHHHH – Que angels singing – this salad is the bomb. Thank you!!! I don’t do lentils but boy oh boy that recipe!!! I made this salad for a pot luck and people went crazy for it. Everyone was like, “are these…beans? What are they?” Lentils, my friends! One guy liked it so much that he took some home in his water bottle. Ha! I added more capers, because I love them, but otherwise followed the recipe exactly and added some greens and nuts before serving like Sarah suggests. This salad will definitely be in regular rotation. I was so shocked at how good this salad is. I found that Garam Masala spice worked very well in this recipe. My daughter requested I bring this salad to her mother in law’s house for a family gathering they are having where several are healthy eaters. After making it several times I know it will be a great dish to add to my rotation of recipes. Just made this salad, didnt quite have all the ingredients, but close enough. ( I will get the rest). So delicious. We are going to be cooking a whole lamb , asado style, on the beach. This will be one of the sides for sure. Informative, no fuss inspiration. Thanks. Looking for ideas to finish a lentil salad I have started, and your recipe jumped out at me. Sounds & looks delicious. Will pick up some goat cheese, more herbs and veg later today. Thank you! Yet another comment to rave about this salad! I made it for a dinner party of non-veggies and had it again (and again) for lunch. Truly delicious – the dressing is amazing. I couldn’t find de Puy lentils so I used whole black lentils which worked very well and held their shape. I substituted dried apricots for the currants which added a nice tangy flavour. Left out the maple syrup altogether, and didn’t have nutmeg or cloves so used mixed spice. I served it on a bed of lettuce, rocket and watercress with roast butternut, toasted almonds and pomegranate jewels – fantastic! Thanks for a really great recipe. I have never tasted mustard seed or asparugus. Now that you say that it is yummy, I wanna have me some folic acid. Thank you. always had my lentils in stew. Will try this though i dont like strong mustard.I hope mustard sauce will work. I like lentil salad, they are delicious. Nice article. It was oh so delicious and a crowd pleaser! It looks like the reviews have all been written by the same person under different names but I am going to try a version of this recipe anyway. I am 99% sure that it’s not the case. This lentil salad has been a personal favorite since 2011. It’s in fact so good that we make a big batch of the spicemix and keep a jar of it in our spicecabinet. Try it! Our favorite add-ins are arugula, walnuts and fetacheese. I hope that’s not true, but I can vouch for this salad…a real crowd pleaser! Whatever gave you that idea??? Are they too positive about this recipe? I can tell you it’s absolutely delicious and it’s no surprise to me the reviewers rave about it. I make it every week or so. b) half a dozen finely chopped gherkins also adds to the flavour. c) one should check the sauce before adding – some may find it a bit too acid and in need of a teaspoon of sugar (for example). But thanks a million for the recipe. Yum, usually I don’t eat a lot of lentils but this looks delicious! This is in fact the best lentil salad ever. I make it more or less according to the recipe but sub allspice for the cloves and cinnamon and lightly pickle the onion. I also add arugula, broccoli, walnuts, and goat cheese. Amazing. This one’s in permanent rotation around here. I have made this salad a few times now. It’s really good. Absolutely love this salad!! Will be my new go to!!! Sarah, you’re totally right. This IS the best lentil salad, evvvvvver. I’ve made it a number of times now, and everyone I’ve fed it to are repeatedly pleasantly surprised. I have a copy of your cookbook and I love it. I recently found out I am intolerant to dairy and sugar (I’ve been breaking out with eczema for 12 years now and managing it with cortisone for 8 of those 12 years). Do you have any other suggestions for cookbooks that may serve me and my intolerances? I would love to see you do a post of your favourite cookbooks one day! I love your blog, you are inspiring! I looked for a lentil salad this morning and when I saw this recipe and knew that I am going to like it. I have tried it and I LOVE it! Will definitely make it again…..and again……and again…. Thanks for this – great looking pics too! OMG…..love, love, love this salad! The only changes I made was I used twice as much cinnamon instead of cloves, used green onion for the red onion and used dried tart cherries for the currants. I did add feta cheese and walnuts. It was soooo good!!!! This will be a new lunch favorite for me! The first time that I made this salad, I did not have cloves, cardamom or currants. I just used raisins. The salad was good, but not great. The second time I made it, I followed the recipe exactly as it’s written; I now understand why this is, indeed, the best lentils salad out there. I had to stop myself from eating the whole thing in one sitting. It is that good! A suggestion, do serve with the “add-ins”; they really enhance the salad. I made this recipe for a Halloween potluck meal. I omitted the cardamom, then added toasted walnuts, carrots, red and yellow peppers and a bunch of parsley. Many people asked for the recipe and I’ve directed them to your wonderful site. Thanks for another delicious recipe. Great cookbook by the way, it’s one of my favourites! It’s got an Indian taste profile. Too much salt, and the tumeric and cumin overpowers the dressing, I suggest reeling those spice amounts in somewhat. One-Third of a cup of capers is actually an entire bottle. I added some dill pickle relish for additional punch. There are many modifications suggested in these comments that are worthy of trying. Rather than the goat cheese (which we tried) I’d suggest Feta, and don’t leave out the walnuts. Additional diced red or green pepper would be nice too. Not sure I’ll make this again. DePuy lentils are rock star lentils that don’t need this fussy of a dressing in my opinion. I agree with Enna’s comment — it was a bit one-note, and overly salty. Both of these issues might’ve been alleviated by trying the optional add-ins, but I kept to the base recipe. I much prefer Gwyneth Paltrow’s Lentil Salad with Mustard and Tomatoes (found everywhere online). That said, I’ve liked a lot of the NutritionStripped recipes — just not this one so much. The spice was overwhelming the clove in particular. My family did not like it all. One recipe for the trash in our house. I made this exactly as the recipe said except I didn’t have Du Puy lentils and used red. On top of that, it was my husband’t birthday and my granddaughter and I were both working in the kitchen (she on the cake) and I overcooked the lentils. I thought, “Oh, no!” – especially when I pre-tasted the dressing and thought it was only so-so. But wow, although you said overcooking the lentils would be the death of the recipe, it wasn’t! Maybe it would be better not overcooked but when everything came together, it was great. I’d planned on Boule with it but when it overcooked and turned into something a little less defined, I thought “Why not use it with a dip on Naan?” So I made naan and it was great. I have to say that when I looked at all the positive and no negative reviews, I wondered if you don’t accept negative reviews but whether you do or not, we were more than satisfied. I can’t wait to try more of your recipes since I just discovered this site. Just wanted to thank you for this terrific recipe. I made it Friday night, and served it Saturday afternoon at a big BBQ. Every single person asked for the recipe – what a winner! ok seriously beyond delicious….what a great work day lunch. I didn’t add currants, but did add a bunch of crunchy veggies. Cucumber, red bell pepper, carrot, celery, chopped romaine lettuce. The dressing is to die for, thank you for the best use of lentils EVER. ok this was beyond delicious….what a great salad to take to work!!! I didn’t add the currents but added a lot of crunchy veggies. Cucumber, carrot, celery, red bell pepper. And oh my the dressing is out of this world. Thank you for the best use of lentils EVER! I decided to make this lentil salad because of the rave reviews and I am not disappointed. This one’s going in my regular rotation. Thanks for sharing! This was ages ago but on the off chance that you see it, here’s my question. I soak my lentils overnight so that they are easier to digest. Any thoughts on whether this recipe would work with those or if anyone has tried it? Oh. My. God. Oh. My. God. Oh. My. God. Oh. My. God. Oh. My. God. Oh. My. God. Oh. My. God. Oh. My. God. Oh. My. God. Oh. My. God. Oh. My. God. Oh. My. God. Oh. My. God. Oh. My. God. Oh. My. God. Oh. My. God. Oh. My. God. Oh. My. God. Oh. My. God. Oh. My. God. Oh. My. God. Oh. My. God. Oh. My. God. Oh. My. God. Oh. My. God. Oh. My. God. Oh. My. God. Oh. My. God. Oh. My. God. Oh. My. God. Oh. My. God. Oh. My. God. Oh. My. God. Oh. My. God. Oh. My. God. Oh. My. God. Oh. My. God. I am 64 and have never commented on any blog until I ate this heavenly salad. I almost passed out from the extreme high I was on while eating. Thank you for bringing so much joy into my kitchen. Fantastique!!! I just made this for the first time today and I LOVE it!! It is addicting, I ate my first bowl and I want more, more, more! Thank you so much, this is simply perfect for the summer weather and outdoor eating. Bon appétit! THANK YOU SO MUCH for sharing this recipe. I love a good lentil salad and this is by far the best recipe – the dressing in particular is just perfect – and I have made it countless times. In a word, Fabulous! I just happened on your site and, since we were planning to have lentils this evening, I made it. I think the addition of maple syrup is inspired. I used golden raisins and a shallot and a little garam masala in the seasonings. I’m going to top it with goat’s cheese – what a feast! Thanks for the recipe, from Sylvia in France . . .
Just picked up your cookbook on the weekend. Beautiful. I made the best lentil salad ever and OMG delicious and so easy to pull together. Love your blog and now love your cookbook. Just wanted to let you know that I finally tried this today. I wanted to test it before bringing it to Easter brunch next week and…WOW! I ate three bowls immediately it was that good. Thanks for the recipe. I am eagerly anticipating the arrival of your cookbook this week and will try to see you in LA if I can! This is the first recipe I have EVER commented on. AMAZING!!!! I left out the cloves. Added cilantro, lemon juice and some roasted beets! Thank you for posting! I absolutely love potato salad and the bacon just pushes it over the top! First lentil salad i have ever cooked and it is amazing! My mind is blown. I didnt know what dupuy lentils were so just used red lentils and all ground spices (non freshly ground). Very delicious, will be making this again! Thanks so much for sharing! This recipe is AMAZING! I’ve made and shared it many times… It’s easy to make and take with you to work, pick-nicks and parties. At least one person will come to me and ask about this fantastic recipe. It’s a winner! Tip: the dressing-spice-list seems a bit long, but with a good GARAM MASALA you can replace part of the ingredients and then add what’s still missing. Enjoy! Thanks for sharing! This was on our dinner table for Christmas thanks to my awesome Auntie. It is absolutely the new fav. in our family – share and share again its delicious! I just love this recipe and have shared with so many friends as well. It really is the “best lentil salad ever”. I always double the dressing. I add half for the recipe requirement and just refridgerate the lentil base. Being the only person who eats this in my house, lucky for me, it lasts days. Each time I eat it, I add a different ingredients and add a little of the extra dressing to freshen it up and coat new ingredients. Heaven on earth and so easy to make. I’ve been making a version of this about once a week for the past several months — so good, and a nice quick weekday option. I omit the currants and toss in a lot of extras — arugula, tomatoes, snap peas, tofu, walnuts — for a one-dish meal. Thanks for the recipe inspiration! I just made this for a vegan potluck supper. It is so good I couldn’t stop eating it myself. When I saw all the ingredients I couldn’t imagine how it would come out, but somehow everything blends together very nicely. At the same time there is a different texture/flavor in every bite. Definitely a keeper. The salad is delicious and I make it for BBQs, kid’s lunch boxes, adult’s lunch boxes and ready in the fridge for a great addition to a mid week meal. Delicious, healthy and easy. How many servings is your salad please? I’m serving six as side for grilled cheese sandwiches (at Burning Man) for an art build crew. This looks great. This is absolutely amazing. I’m thinking of adding or subbing some quinoa to get my complete protein + whole grain needs checked off, any ideas for ratios? This is seriously good. Thank you. Fantastic salad! Thank you for sharing! This was a huge hit. I included roasted cubes of sweet potato for a little colour and goat cheese. WONDERFUL! THIS IS AN AMAZING RECIPE! I never thought the words amazing and lentils could be in the same sentence. I’ve been looking for cheapish, healthy lunches, that can be made in advance, and that are good at room temperature for on the go. Only change I made was adding cooked brown rice when I’m serving (I think if I added to the mix and let sit in fridge maybe would get too gummy). such a great balance of flavors. My grocery list says “lentils x4” i.e. enough to make this every week for a month 🙂 Thanks so much for sharing. Ah, just one question, how much is 1 cup dried fruits in gramm? When I made this salad the first time, I had only 125 gr. redcurrants. And the second time, I have added all the raisins I had at home, around 210 gr., and this seems too much. Asking google, it says 1 cup = 240 gr. but looking at the amount of raisins I used last time, that sounds far too much to me. Many thx in advance for your answer. I think it’s about 150 grams! I found your website via Okka Rohd’s Blog “Slomo”, she introduced your Big Comfy Sweet Potatoe with the Red Blanket Sauce there recently. I am so thrilled finding your site … made the this lentil salas two times within the last 2 weeks – i cannot get enough – it is absolutely terrific. And I had all spices at home already 🙂 I have recommended your page to a couple of friends already and registered here a couple of days ago. And I have bookmarked lots of your recipes. Again … I am so thrilled finding your site. I’m looking forward to your next entries. All the best! I made this today. I can honestly say it is THE BEST COLD LENTIL SALAD I’ve ever tasted. I am a personal chef and my clients are getting this tonight. The flavors and spices and texture of this dish are absolutely delightful. This is a fantastic recipe. I cut down on the currants, as the end result seemed a bit sweet. I added some walnuts and feta cheese which helped offset the sweetness. Delicious! Definitely the best lentil salad ever. I’ve made this several times and I consistently have someone asking for the recipe. I like adding walnuts and sometimes carrots. It is so delicious I could eat it for days without ever getting tired of it. Or finish it all in one sitting. Thank you and I look forward to exploring your other recipes. This looks so yummy that I’m going to give it a whirl tonight. I love lentils!! Thank you for sharing! This really is the best lentil salad, ever! YUM. Thank you so much. WOW! I had one cup of cooked lentils in the fridge and I was starving tonight, so I Googled lentil salads. Your website came up among the very first ones, and since I love all your recipes and am a big fan, there was no question whose recipe will I be making tonight. And boy, was I blown away!!! The salad dressing is amazing, so balanced and flavorful! I had all ingredients, except for capers, so I subbed it with homemade pickles and black olives. Oh and no goat cheese either, but I will surely add some next time, which will be tomorrow. 🙂 I’ll also try it with quinoa. You should have seen me spooning the last bits of lentils from my plate… I was so sad I couldn’t have more…barely one cup was not enough of this awesomeness! Thank you so much for this one (and all the others), I’ll be making this often! I’m going to serve this salad as the starter for my New Years lunch (01.01.14). Maybe I’ve missed this data point, but would someone please tell me what the serving yield is for this recipe. Thanks, and Happy New Year! NB: The French — perhaps other or all Europeans — eat lentils at New Years to promote growing wealth in the new year. opening in I.E., it’s got some overlapping issues. I just wanted to provide you with a quick heads up! Hi there! I was so inspired by the currants and capers I had to try this recipe, even though I greatly dislike the taste of cumin! So I tweaked the dressing a bit, omitting the tumeric and cumin, and instead using a bit of fresh basil and thyme, and the caper liquid, along with some pomegranate molasses and sherry. I used some nice block feta for garnish. Thank you so much for the inspiration, what an awesome result! What a treat! I was weary of all of spices the recipe included at first and amount of salt, but once mixed all together, SOO AMAZING. Made this dish for a friend who just had their second child and I had to use some real self control not to take (too many) bites. Your blog is so lovely — thank you for sharing! Love it! Definitely enjoyed it in the summer and am now enjoying the transition into fall, when fresh veggies are a little less available and I want substance-y food. Plus, I just married a Canadian and moved to Canada, so anytime I use maple syrup I get to give myself a little mental hi-five and hope that immigration will appreciate my culinary patriotism. This is an awesome salad. I added some chick peas-wonderful! 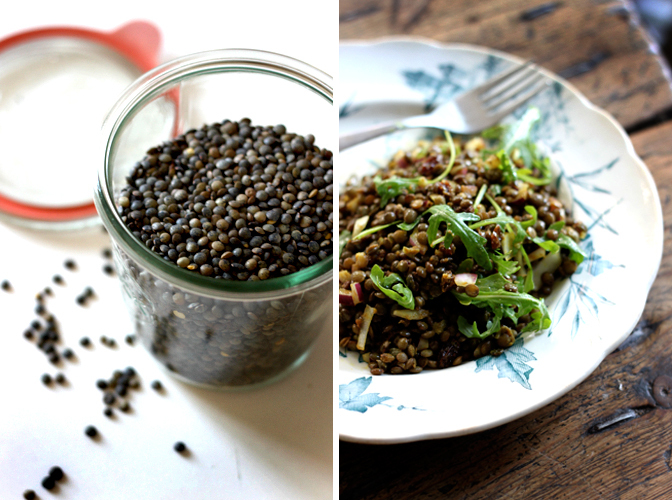 Just made this and it is SO THE BEST LENTIL SALAD EVER ! Thanks Sarah!! Help Help! There’s no “Print This” button for this recipe! I tried it last week and it IS the best lentil salad ever! And it held up for days in the refrigerator. It made a really big bowl and I shared half of it with my friends and they loved too. Omg, thanks so much. Made this salad for a picnic, and it was enjoyed; It is not run of the mill salad fare, and I found the flavors very palatable. Instead of the oil, I used 1 Tablespoon of chia seeds blended with 1/3 cup of water. This worked well. OMG, thanks for this amazing salad! It’s soooo delicious! Try it people! Loved this salad and wanted to email a copy to myself but couldn’t do it. I have been loving chick peas roasted and various other ways but I think lentils will be my new “go to” vegetable/protein for dinner – mixing it up with whatever I have at home. pretty much the best lentil salad ever!! i just made it and LOVE it. thanks for sharing. My sister in law passed this on and it is fabulous!! I pinned this a long time ago and finally got around to making it today: WOW. I ended up having to use a mix of black lentils (incidentally leftover from your Reverse Universe Soup) and grocery-store French lentils because it was all I had on hand, but it was still *fantastic. * Other than that I followed the recipe exactly, adding only goat cheese as a mix-in. Sooooo much more exciting than any of the underwhelming lentil salads I’ve tried. Thanks! Very good. Only suggestion i have is to use only 1 tsp salt. Buen provecho! Added some sundried tomato to mine and it was delicious! I don’t live in the USA anymore, but used to purchase from them when I did. Question: Where can I buy these Du Puy lentils online? I live in the midwest and not near health food or specialty stores. I am looking forward to trying this delicious sounding recipe. Thanks! Amazing! Making this to pair with my kale salad for lunch! I had a few spoonfuls and am looking forward to my brown bag tomorrow! Thanks so much for this great recipe, your passion is contagious! Pingback: Spiced Sweet Potato, Carrot + Cauliflower with Bulgur Wheat and Chickpeas | Eat This! Love this recipe– the vinaigrette is so fragrant, and I love the combination of the sweetness of the raisins with the flavors in the dressing and onions and substance of the lentils. Like many others have said– this will be my go-to lentil salad recipe in the future. Delicious! I came across this receipe on Buzzfeed yesterday and after work I tried it. I exchanged the du puy lentils for red ones, cooked them until they were al dente and then mixed them with the dressing. I also added some dried dates and will probably add an apple, too, but the salad, as it is, is really delicious! Thanks for the receipe! Pingback: Lentils on My Mind | Howsabout…? This recipe has literally changed my life!! I love it. It has been a saviour for lunches on the go in a city where sandwiches/anything-fried seems to be the only option. And on long journeys when service station food is all there is…I just whip out my lentil salad and feel a bit smug that I’m not chomping on vending-machine rubbish or fast food. Winner! I’m not a massive onion fan so I leave out the red onion and add walnuts and sunflower seeds. This is the perfect recipe for lentils. Very tasty and blends well with other salads, I had some chickpea salad and beets and apple salad with in over greens with a lovely slice of home made rustic Tuscan bread drizzled with my best olive oil and a touch of sea salt: All consumed alfresco on a beautiful sunny afternoon while gazing out at the sparkling waters of the lake. Very delicious!!! So happy to have discovered this recipe. Even my lentil skeptic husband enjoyed – bonus! Thanks for sharing. Thanks so much for this recipe. I followed it exactly…and it was DELICIOUS, FANTASTIC! DELICIOUS!!!! I’m so glad there is so much of it left, so we can enjoy this over and over for the next few days! The tip of my tongue is still tingling from the amazing blend of spices. Absolutely mouth-watering. I opted for raisins in the place of currants, and before serving added arugula, goat cheese, and walnuts. AMAZING! Thank you for sharing!! This was LOVELY! Loved the dressing but may cut the salt next time. Loved the capers! I used raisins which I chopped finely. I added chopped red pepper and served on a bed of arugula and pea shoots with feta on top for dinner last night. I had some of the lentil salad for lunch today and it was even better! What a keeper! And such wonderfully healthy spices too! This is truly the best lentil salad I’ve ever eaten. I omitted the black and red pepper for my kids’ sake, along with the capers and currants. I substituted a large, sauteed leek for the onion and added a big handful of chopped cilantro at the end. It was fabulous for dinner, served over warm farro with a squeeze of lemon. My daughters devoured it and took the leftovers to school for their lunch today. It is truly the best! I am totally addicted to it to be honest. Today I actually used the seasoning to create my first ever lentil dip (with a bit more mustard and some oat flour), and it is still awesome! i’ve tried a bunch of lentil salads, and this one knocks the socks off of ALL the rest. i wasn’t sure about all the spices in the dressing, but it’s quite heavenly and perfect. i made this with 3:1 lentils:pearl barley and threw in a roasted sweet potato. then added arugula, walnuts, and goat cheese. WOW! i will be making this all summer. i’m eating it as i write this…oooh the cayenne is so nice. you’re the best, sarah! I’ve been so tired of green lentil soups so I wanted to make a fresh cold lentil salad w/a different type of lentil. This is the best lentil salad I’ve ever had. From the warm spices to the refreshing bite of the vinegar and capers it was perfectly balanced. I will make this my new household staple. Thanks for making me feel like eating healthy is delicious! Pingback: 11-Spice Lentil Salad with Capers and Currants | the taste space - steam, bake, boil, shake! Sarah, I love your food and this salad is just amazing. What other recipes do you have that you think are as special as this one? You’ve used the word ‘best’ very appropriately. I was skeptical about this recipe because the flavors are indeed unexpected. I would never think to pair all those spices together, but that’s what drew me in (and Sarah B.’s recipes never disappoint)! This was so tasty. I added lots of cucumber, subbed cranberries for currants, added raw kale, and served it topped with avocado, toasted walnuts, and hemp seeds. I halved it and it made around 6 generous servings (I think); regardless, halving the recipe still makes a lot. I plan on only making the full recipe for large gatherings like parties and potlucks. This looks amazing! Do you know about how many servings this makes? Amazing! I was heavy-handed with the cayenne and turmeric….threw in roasted butternut squash and the goat cheese, arugula and walnuts as suggested……divine! Hi Sarah! I love your blog and I’ve made several of your recipes. I was wondering, how many servings does this make? Sarah, I love your blog and I LOVE this salad. I just wanted to share my new favourite ingredient: cilantro sprouts (often available at your local health food store). They add the perfect texture and flavor. This is now my go-to lentil salad recipe. At first I thought it was too big, but found myself eating it straight out of the salad bowl every time I passed the fridge. So glad I found your beautiful blog. I´ve never been a big lentil salad fan- but I LOVE this and I have made it twice already, adding in red pepper and cabbage. Season´s greetings and keep up the good work! My goodness this was so darn yummy. I had to make some substitutions (green lentils, dates and balsamic vinegar) because I was missing some items. Will make again and again. You are not kidding when you say this is the best. I could not agree more. The flavors are dynamic without being overpowering. And it’s versatility would allow you to take it on a picnic but also dress it up with toasted nuts and crumbly cheese for a dinner party side. Lovely. This was so tasty, thank you. Mmm mmm such a surprise of flavours and it goes with anything (I also home-smoked some salmon and they went very well together!). Holy moly. I was skeptical at first, but this dressing is dy-no-mite!! I only added 1 tsp each of salt n peppa, and was a little shy with the spices but kept up the ratio. mmmmmmmmmm so damn good! Thanks Sarah! I made your lentil salad last week and it was just great! In general, I love mixing ingredients that might at first sight seem a little exotic together, that´s why this salad absolutely suits my taste. I hadn´t thought that all the spices in the dressing work soo well together. And congratulations to your great blog, I will get further inspiration here (and information). Looks great! My Mom’s lentil recipe is JUST as good and addictive! Mix the dressing in a jar and pour over lentils, onion and parsley. Soooooo good! When she makes this I literally eat 3 cups of lentils in one sitting!!! This salad REALLY is amazing. We made it yesterday and LOVE it. THank you. Also, I am so happy I found your blog. It’s absolutely beautiful and full of wonderful information. Thank you for all the time you put into it. This recipe rocked my socks off! The vinaigrette is mind-blowingly good and really works with lentils. Did this one with tart dried cherries (cause I couldn’t find dried currants); added minced carrots and celery, chopped parsley, and goat cheese. Goat cheese is beautiful in this salad, and I saw someone’s comment about pomegranate seeds, which would also be amazing. Will definitely make this again! I made this salad for fathers day and it was amazing. I followed the recipe except I doubled the olive oil and spice mixture becuase it was a little dry with amounts provided. The goat cheese and celery were perfect additions. Im eating it today, on the third day, and it is even better. I served it with butter seared scallop and it was a hit!!! Next time I will increase the amount of capers, add carrots, and make it a day or two before it is to be served. Oh Em Geeeeee! This baby rocks!!! I made this for a school potluck recently and everyone loved it- even the somewhat elderly, diabetic (mean) security guard. Keeper. I chopped up fresh tomato and cucumber in it. I made this salad sometime last week and am still eating it. Tonight I roasted broccoli with olive oil, and salt, then mixed it up finely chopped with the salad. Added a squeeze of lemon and some flax oil and I was set! Best lentil salad with broccoli ever! Just made this as part of a diet drive. Wife and myself loved it! A real middle eastern twist those spices and the Le Puy lentils themselves were delicious (couldn’t ever imagine writing that!). THANKS for sharing this wonderful recipe! – My kitchen is so much enriched by your blog, you are my BIG discovery! Made this for lunch and it was A-AMAZING! I feel all zingy this afternoon and I think it might be something to do with all the wonderful spices that went into the dressing. Love this site more and more each day. I agree, you didn’t lie. This is one amazing salad. 🙂 Thanks for sharing! That is one amazing salad. It doesnt happen often when something labeled ‘the best’ actually delivers. I didnt have cloves. But it still worked greatly. I made this salad and the flavor from the spice blend was definitely harmonious, but slightly intense. I found that mixing it considerably with some quinoa was an excellent and, for me, necessary merge for this salad. I am making this salad for about the fifth or sixth time. Every time I make it I end up sending the link to your blog to a whole bunch of people because everyone goes NUTS over it. Seriously good. I have made several other recipes from your blog since and have loved them all. Keep up the amazing work! I was a little skeptical about a lentil salad actually being delicious, but I can confidently say that I have now made this salad TWICE. I’ve halved the recipe both times and I quite seriously need to put aside half and put it in the fridge to stop myself consuming the whole thing in one sitting. You really weren’t kidding… it’s amazing. I just made a lentil salad based on your recipe and it was so delicious! Thank you so much for sharing all these wonderful recipes, and inspiring others to live healthier! Sarah, I have been looking for a lentil recipe that looks like I want to try it and this sounds delish! They are sooo good for you that I hope I can convince the kids to try this too! Thanx for sharing your fave! The lentil salad recipe I was looking for! Délicieux! I have been reading your other blog for awhile and I don’t know why it took me so long to click over to this one. It’s inspiring! I am going to print out lots of your recipes to try. I think my stomach will thank me for it. I came across your blog a little while ago. Made the lentils the other day and wow, they were good. Havn’t seen DuPuy lentils yet here in Vienna, but I used beluga lentils that keep the bite too. Al dente lentils are a revelation for me! They were incredible with the nicely spiced vinaigrette. My toddler had a ton of fun nibbling on the cardamom pods and shaking the jar, so thanks for the yums and the fun! made it on the weekend (forgot the capers…oops) it was so yummy! everyone loved it! thanks! This dish is absolutely amazing, perfect picnic food. Congrats on your upcoming wedding! I’m going to have to make this very soon, it sounds so good! Then I’ll finish with a raw chocolate milkshake, yum. we love lentil salads, and i’ve bookmarked this for when we are back home. your new (to me) blog layout looks awesome! just wanted to let you know it looks perfect. This looks (and sounds) delicious, and I haven’t used Du Puy lentils in my cooking yet. I will definitely be trying this soon!